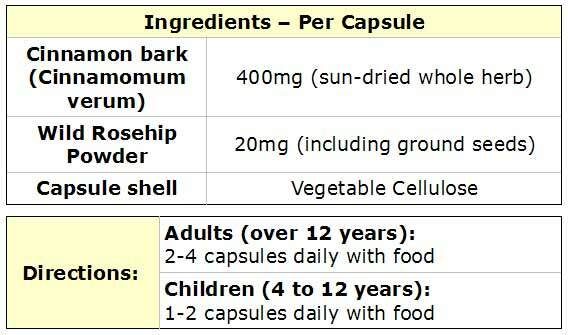 Adults may take 2 – 4 capsules per day depending on personal requirements. Cinnamon has been linked to helping to prevent and treat Alzheimer's disease, and much scientific research is taking place with this focus. Cinnamon is also confirmed acts as a digestive aid and can often relieve bloated feelings. Some very interesting research had been in to cinnamon as a diabetes treatment. Cinnamon has been found to act like insulin, which decreases blood glucose levels, triglycerides and cholesterol.As little as 3 capsules a day for a diabetic can significantly reduce blood glucose levels. Please visit the "Further Reading" tab above for advice on more conditions Cinnamon can aid, or see "Health uses" tab. Don’t forget you can contact usonline for advice on supplements too. The Cinnamomum Verum tree, also commonly known as "true cinnamon", Ceylon or Sri Lanka cinnamon belongs to the plant family Lauraceae, which is native to Sri Lanka,Bangladesh, India, and Myanmar. The inner bark of this tree is used to make cinnamon. Cinnamomum verum trees are 10–15 metres tall. The leaves can grow up to 18cm long. The flowers are a pale green colour, and have a distinct scent. Small purples berries grow on a cinnamon tree. True Cinnamon is made in South America and India, but cassia mainly in Asia Useof cassia as a supplement should be avoided as discussed within the further reading section of thisarticle. Cinnamon supplements have a whole host of health benefits when used correctly as part of a healthy diet. The information below is a comprehensive guide listing facts about Cinnamon, popular uses and medical research. 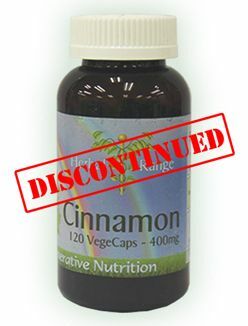 The type of cinnamon contained in Regenerative Nutrition’s cinnamon vegecaps is "True cinnamon” or "Cinnamomum verum” This is the only truly safe species of cinnamon that should be used as a health supplement. We highly recommend, for your own wellbeing, that only capsules containing pure "True Cinnamon” such as Regenerative Nutrition’s capsules are the only ones that you purchase. Our vegecaps can be easily pulled apart and the contents sprinkled in to warm water to make tea, or used with any of the recipes outlined in the uses section below. The most beneficial aspect of cinnamon is its essential oil, so do not add very hot water or these may evaporate. Powdered cinnamon tends to dry out and lose its essential oils. That’s why we recommend keeping your cinnamon supplements stored in the vegecaps until consumption and the jar tightly sealed, and use all the contents within 3 months of opening to get the maximum benefit from your purchase. Like any change to your diet, the addition of Cinnamon supplements may disrupt your sleep a little. If this does happen, take one capsule in the morning only until your body has adapted, then gradually increase the dose. The time to adapt to new health supplements or diet changes is usually one to three weeks. The following are a list of past and present uses for cinnamon verum for a wide range of ailments. Dieters regularly rave about cinnamon and honey solution for weight loss. Due to its cleansing and detoxifying properties, cinnamon can help to shed extra inches by relieving bloating and eliminating toxins that slow down the digestive process. A common use of cinnamon for weight loss is mixing it with warm water and honey in the evening and drinking half the mixture before going to sleep, and cooling the other half of the mixture to drink in the morning. The release of toxins often also improves energy and mood. Cinnamon powder can be mixed with honey and used as a paste on various breads and toast for breakfast. Regular consumption of cinnamon paste will strengthen the heartbeat, prevent artery blockages, and revitalise blood flow. This is a popular remedy in many nursing homes in America and Canada. Mixing honey with water and a small teaspoon of cinnamon powder creates a smooth paste to apply to insect bites. After adding the cinnamon paste, bites are much less itchy and painful. A cinnamon tea made with hot water, two spoons of honey and a teaspoon of cinnamon powder is a powerful pain reliever for arthritic pain if drunk 3 times a day, according to a test carried out by Copenhagen University on 200 arthritis sufferers. Mixing up a special hair treatment using hot olive oil, a dash of cinnamon powder and a table spoon of honey has been found to be effective in treating hair loss if left on the scalp for 15 minutes before a shower. A cinnamon drink made with 2 table spoons of cinnamon powder, some luke warm water and a dash of honey to taste is thought to eliminate germs from the bladder. A sweet mixture of cinnamon powder and plenty of honey can be applied up to 3 times a day to an aching tooth to help relieve pain and throbbing. ·Doctors have proven that half a teaspoon of cinnamon powder a day can reduce LDL cholesterol. ·In some studies, cinnamon has shown an amazing ability to stop medication-resistant yeast infections. ·In a study published by researchers at the U.S. Department of Agriculture in Maryland, cinnamon reduced the proliferation of leukaemia and lymphoma cancer cells. ·Cinnamon can stop blood from clotting. ·Kansas State University studies revealed that cinnamon fights the E. coli bacteria in unpasteurised juices. ·Cinnamon is a very good source of manganese, fibre, iron, and calcium.